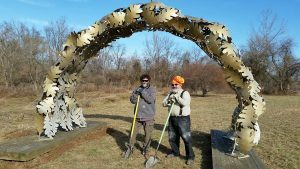 Jim Gallucci’s “Golden Oak Leaf Arch” is the latest addition to New Hope’s Outdoor Sculpture Project. The long-awaited placement on Saturday, Jan. 12, at the Rabbit Run Creek community adjacent to Route 202 in New Hope required the use of a crane by exhibition specialist and sculptor Harry Gordon of Lambertville. The 13 foot high powder coated steel construction is one of 18 contemporary works by regional and national artists that comprise New Hope’s ongoing free outdoor sculpture exhibition. Greensboro, North Carolina native Galucci is internationally known for his large scale metalwork.”Golden Oak Leaf Arch” is 13 feet in height and constructed of powder coated steel construction. Begun in 2003, New Hope Arts‘ outdoor exhibition continues with the support and partnership of patrons who sustain and maintain this walkable, family-friendly public art display. Pamm Kerr of New Hope is sponsor for the four new works installed in during the last year, including this latest addition. Over the years, the Sculpture Project has displayed more than 80 works, exhibited on a rotating basis throughout the Borough of New Hope. A sculpture map is available online. Gallucci has participated in the New Hope Arts Outdoor Sculpture Project since its beginning. His “Listening Bench” was added in 2015, and is currently placed at the Bucks County Children’s Museum.